Every website is unique, but not all parts of the site are. One of the most powerful techniques of a professional web designer is reusability. Create it once – use anywhere. A simple example, imagine that you have a contact information placed all across your website. You decided to change your office location. It would be a nightmare to edit all the pages just to change an address line. To help you out, Visual Composer Premium offers you Global Templates add-on. Global Templates allows you to create layout templates and place them on your website. Change the template and your changes will be automatically distributed across your site. From the example above, you will need to simply change the address line in a template and your site will be updated – as easy as that. Edit contacts, features, promo sections, and more from one place – hassle-free. To add Global Templates add-on to your site, simply navigate to Visual Composer Hub section Add-ons. Select the Global Templates add-on and click download. After successful download, you will receive a confirmation notice. Name your template and create a layout with Visual Composer. Once your template is ready, save it and you are good to go global. From the drop-down list select the template. Note: Global Template element will show you all available templates you have ever made, including Header, Footer, and Sidebar which means you can insert them as a global template into your layout. Important: All templates downloaded from the Visual Composer Hub will be available in the list, but upon edit, it will remove the link between the template and Visual Composer Hub to ensure proper future updates and cases if you want to revert changes. To revert back simply download a new copy of the template from the Visual Composer Hub. You already have templates created? 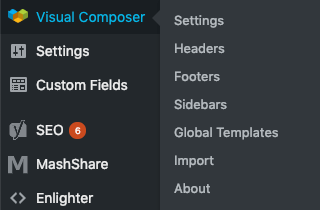 Don’t worry, Visual Composer Premium will automatically convert your existing templates into global ones and add them to the Global Template section. It does not mean that you will now have only Global Template option. Add your templates via Add Template window and they will still act like a regular one.